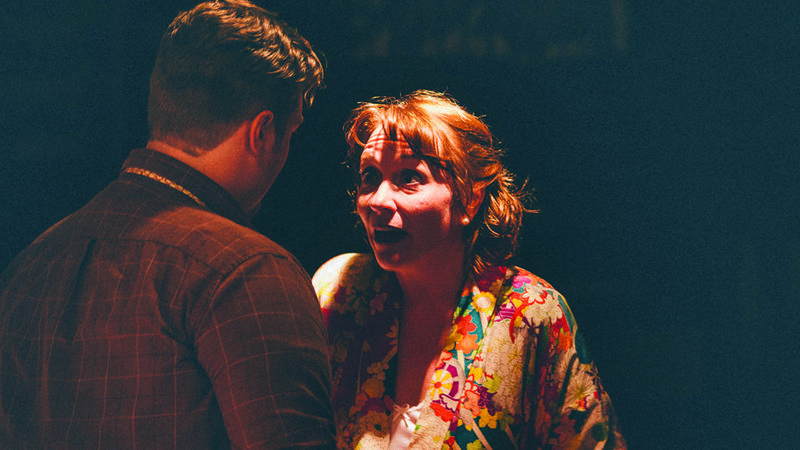 Stanley, played by Alastar Dimitrie, and Stella, played by Mary Wardell, discuss the issue of Stella’s sister during a performance of “A Streetcar Named Desire,” at the Ore Dock Brewing Company recently. MARQUETTE — Sunday night, I attended my third UP Shakes production at the Ore Dock Brewing Co.–Tennessee Williams’s “A Streetcar Named Desire.” It was no surprise that director Jamie Weeder, who also provided a bit of comic relief as character Eunice Hubbell, made optimal use of the upstairs space, incorporating the venue’s small stage, dance floor and bar into the production, as well as the audience, which I’ve found to be a consistent and thrilling aspect of UP Shakes shows. The set was sparse–two beds with a nightstand each, a standing mirror, and little else. The actors were left without walls, as the set was constructed in the middle of the room and surrounded by audience seating. This directorial choice lent itself beautifully to this particular play, which is not meant to impress by way of costume or elaborate set design, but, rather, by transparency and vulnerability on the part of the characters. Though the actors had, from the beginning, Williams’s masterpiece script to work with, Weeder left them little else to hide behind, but raw talent and the cast’s ability to convey the truths of their characters, particularly on the parts of lead actors Jessica “Red” Bays and Alastar Dimitrie, proved the cast need nothing, indeed, to hide behind. At intermission, of which there are two during this two-hour and 15-minute production, I heard a conversation between audience members regarding the dance interludes peppered throughout the production. At intervals, the live jazz band kicks up, the actors disappear offstage, and out come two beautiful young women (Devon Pickens and Melissa May Neal), dancing seductively with a much older man (John Sarkela) and, at times, with each other. My fellow audience members were admittedly confounded by the presence of these sexually charged, ethereal dance numbers, and as I listened to them offer up possible explanations and interpretations, I thought about the director’s choice myself. Though I was unfamiliar with “A Streetcar Named Desire” previous to my UP Shakes experience, I am not unfamiliar with Tennessee Williams altogether, having read and seen a performance of “The Glass Menagerie” as an undergraduate in college. While that was some time ago, I remember being impressed by Williams’s exploration of memory, the loss of youth and innocence, trauma, denial, and alcoholism. Weeder’s inclusion of these whimsical and, at times, unsettling dance interludes worked to emphasize the main character, Blanche DuBois’s, struggle to reconcile the traumas of her past and live in the present. Witnessing the undoing of Blanche DuBois is heartbreaking, surely, on the page, but on stage, actor Jessica “Red” Bays gives tortured, fraying, desperate life to the character. From the opening of the play, it’s evident that Blanche is, despite her efforts, not what anyone would describe as “self-possessed,” and by the end of the play, Bays has shown us a woman who is still very much a girl, caged by youth in spirit and mind, unable to conceive of a future beyond her pain. Bays’s capacity for vulnerability and emotionality is something mighty to behold. 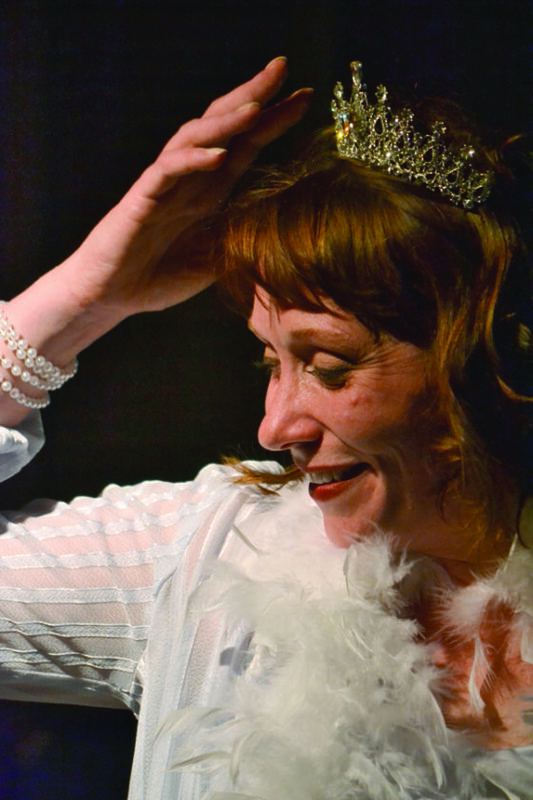 Blanche, played by Jessica “Red” Bays, wears a tiara as she descends into madness during a performance. “A Streetcar Named Desire” is my third privilege to watch Alastar Dimitrie on the stage. His ability to wear the skin of whomever or, in the case of “Frankenstein’s Creature” last fall, whatever he is cast, is uncanny. As Stanley Kowalski, he is loud, manipulative and cruel. And, yet, the evident love he has for his wife Stella (Mary Wardell) renders him, for a few brief and scattered moments throughout, endearing despite gross self-interest and a sweeping lack of humanity on the whole. Dimitrie never fails to captivate the audience, not just by the easy presentation of his lines or the concentrated choreography of his body, but by the utter loss of himself, “the actor,” in whichever role he has taken. The rest of the cast served to shade the production with moments of levity, awkwardness, honesty and heartache, with characters like Mitch (Jeffrey Butler) offering up hearty portions of each–occasionally all at once. With performances to come on July 19, 23, 25, and 30 at 7:30 p.m., I cannot recommend this production highly enough. What an excellent service UP Shakes is doing for the community by giving life to works of art by the likes of Shakespeare, Shelley and Williams. This poignant interpretation of “A Streetcar Named Desire” has me, already, looking forward to “Titus Andronicus” this fall. 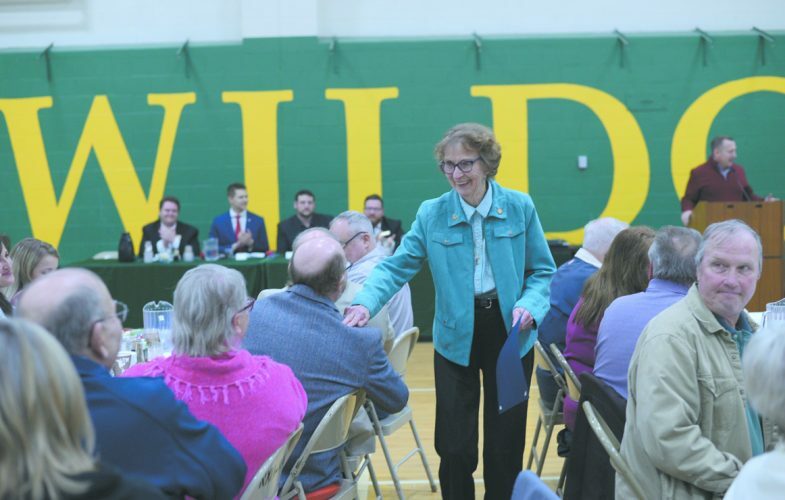 Editor’s note: Brenna Womer is an MFA candidate at Northern Michigan University where she teaches composition and literature in the English Department. She is an associate editor for Passages North, and her writing has appeared or is forthcoming in “The Normal School,” “DIAGRAM,” “The Pinch,” “Hippocampus,” “Booth” and elsewhere. 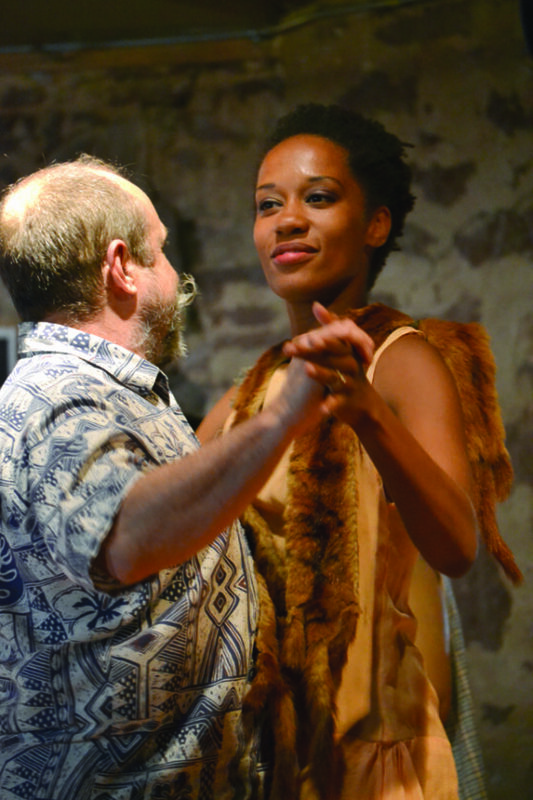 John Sarkela and Devon Pickens, who play various supporting roles, dance between scenes, embodying the heat and passion of New Orleans, where the show is set. Mitch, played by Jeffrey Butler II, faces Blanche, played by Bays, in the show’s tragic romance between two lonely people. 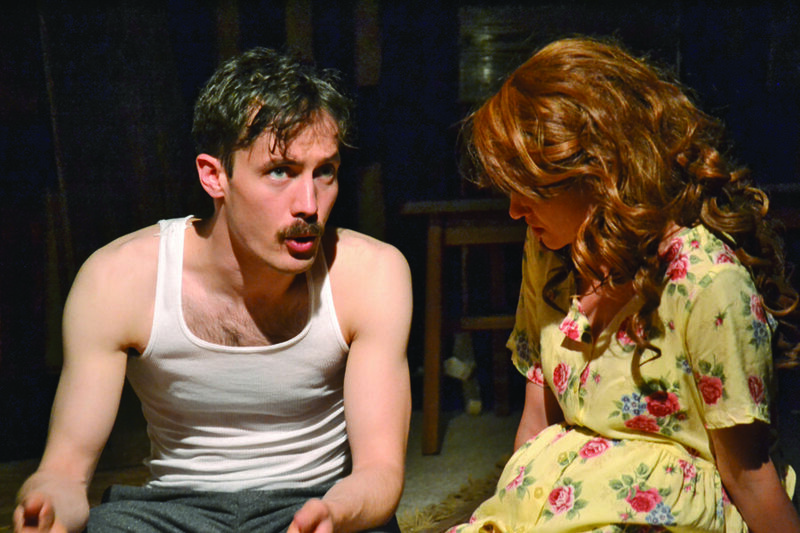 The play by Tennessee Williams is being produced by Upper Peninsula Shakespeare Festiva. Directed by Jamie Weeder, it opened Sunday and continues its run Wednesday, Sunday, July 25, July 30 and possibly Aug. 2. Shows are at 7:30 p.m. Tickets can be purchased online at www.upshakes.org.